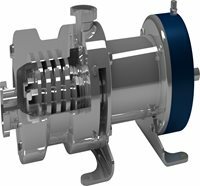 So that the materials to be conveyed are preserved: The Twin-Screw Pumps work in accordance to an extremely gentle principle. Two non contacting intermeshed transporting screws form closed chambers inside the pump housing, which conveys fluid from the suctions to the discharged end. This means the materials conveyed are preserved and remain intact with regard to size, appearance and surface. 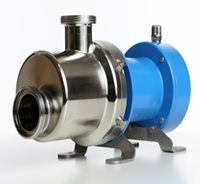 Here, Bornemann SLH pumps are used for cautious, low-pulsation conveying of liquids. The pumps can convey abrasive media and solids up to max. Ø 40 mm. Due to the high speed of 100 to 3000 rpm, viscous media and cleaning fluids can be conveyed with one pump. The pumps are capable of CIP and SIP. The Bornemann SLH pump is EHEDG and A3 certified. SLH-pumps are also available with 3A-label as far as 3A-design rules, e.g. single acting seals, are applied.